The recipe of the week for this week is vegetable chili. This is a delicious and simple way to have an awesome meal. 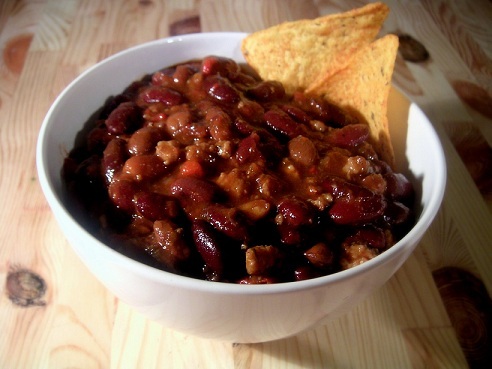 Although this is a vegetarian chili recipe, feel free to add your favorite meat to it whether it be ground beef, shredded chicken, ground turkey, etc. The recipe is designed to make about 3 servings so if you want to make more simply double, triple, etc. the recipe. So if you want to make enough for six servings, simply double the amounts of everything in the recipe. Listed below are the ingredients needed as well as the step by step directions to create this delicious vegetable chili recipe. If possible, try and buy everything organic. 1. Using a medium to large pot, heat the 2 tablespoons of avocado or olive oil over low heat. 2. Next, dice the sweet onion, green pepper, and jalapeno pepper, and mince the garlic. 3. Add the chopped onion, green pepper, garlic and jalapeno pepper to the pot and turn the heat up to medium. 4. When the onions start to brown a little bit and soften, add the diced tomatoes along with the all the cumin, cinnamon, and red pepper and cook for 2-3 minutes. 5. Next, drain and rinse the pinto and red beans and add them to the pot. 6. Let sit and pot until everything is warm and ready to serve. 7. Add a little bit of salt and pepper (if needed) and serve! If you are a bit of an extremist and crazy about health then you would want to use raw beans instead of canned beans. To do this, soak 1/2 cup of pinto beans and 1/2 cup of red beans in water overnight. Drain the beans, and add them to a large saucepan with 3 cups of added water. Bring the beans to a boil, then cover the saucepan with a lid, turn the heat to low, and let simmer for about an hour. So for step 5 in the recipe above, instead of adding the canned beans to the pot, add the cooked raw beans to the chili instead. Well there you have it! You have just created a delicious vegetarian chili dish for everyone to enjoy. If you have any questions regarding this vegetarian chili recipe, do not hesitate to ask. Our email is phenom.fitness.and.health@gmail.com. If you want recipes for some other delicious, healthy dishes, check out our “recipes” section of the site.